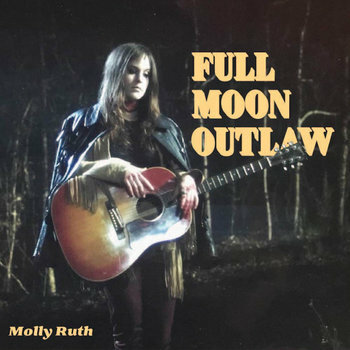 In Molly Ruth’s debut album, Full Moon Outlaw, 70’s rock and roll, Delta blues, and country ballads are thrown prostrate before Nature’s terrifying violence. Every song is a blood-sacrifice. Sometimes she howls to the animal kingdom, sometimes sermonizes in a spirit language, sometimes she is wailing a bitter, jealous country ballad that leaves your heart ragged and your soul purified. Ruth exhumes the ancient and resurrects it in the voice of Grand Ol' Opry— her heartbroken country classics are littered with the symbols of tragedy and myth, her gritty blues songs are otherworldly ruminations on ecstatic rapture and star knowledge. Molly Ruth cries out her visionary impressionistic country hymns and they pierce your heart like a lonely spear flying to the back of a jagged toothed mountain cave. She razes each stage she steps on, returning it to the land, consecrated by the blood of her kill and baptized in her sweet eulogy. To enter the world of Molly Ruth is to flee homeless and unborn through the thunder. To seek visions, and find knife-fights. To commune with elders and animals. To play until your strings break. To fear that absolution is always just over the next mountain ridge. To live as a Full Moon Outlaw. Sign up now and download 'Odin' for free!